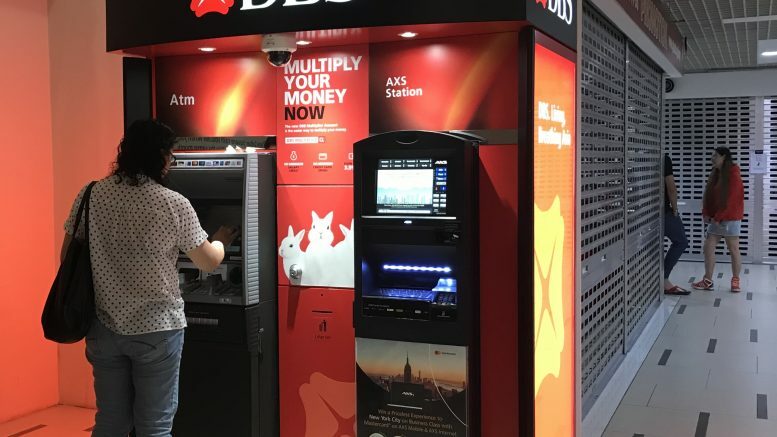 Singapore’s largest bank DBS said on Monday that its net profit rose 76 percent on-year to S$1.41 billion, missing some analysts’ forecasts. Excluding some one-time items, including year-earlier ANZ integration costs, net profit for the quarter ended 30 September would have been up 72 percent on-year, the bank said in a filing to SGX before the market open on Monday. Manulife US REIT said on Monday that its net property income for the third quarter rose 74.9 percent on-year to US$25.15 million, mainly on strong income contributions from four office properties acquired in 2017 and 2018. OCBC said on Friday that it signed a memorandum of understanding with Chinese technology giant Xiaomi and small-and-medium-sized enterprise lender Hanhua Financial Holding to promote an integrated financial services model in China. Venture Corp. reported on Friday that its third-quarter net profit fell 27.5 percent on-year to S$80.8 million, mainly on customers’ planned transition to replacement products and some customers’ mergers and acquisitions (M&A) activity. Sembcorp Industries said on Friday that inked a deal to install, own and operate rooftop solar panels on top of two Singapore facilities owned by a large global provider of energy industry products and services. ComfortDelGro said on Monday that it would acquire Australia’s Buslink and Buslink Southern, which operate a fleet of 401 buses across four Australian states, and their 11 bus depots for a total of A$190.9 million, or around S$187.0 million. Property developer and construction firm Chip Eng Seng reported on Friday that its net profit for the third quarter rose 8.4 percent on-year to S$14.28 million amid a “robust” revenue contribution from the property development and hospitality divisions. NetLink NBN reported on Friday that its fiscal second quarter profit after tax was S$18.69 million, beating the projection from its IPO prospectus by 16.2 percent. Singapore Press Holdings said on Friday that its wholly owned subsidiary, Quotz, subscribed for 1.5 million shares, or a 30 percent stake, in sgCarMart Financial Services (SGCMFS) for S$1.5 million. SGCMFS primarily provides inventory financing to car dealers and vehicle-hire purchase to consumers, while Quotz is a subsidiary of SGCM, which owns and operates the sgcarmart.com car-classifieds website, it said. T Financial holds 51 percent of SGCMFS, while five other parties hold the remainder, it said. Mapletree Logistics Trust’s manager said on Sunday that the opening of its redevelopment of Mapletree Ouluo Logistics Park (MOLP) Phase 1 in Pudong New District, Shanghai, had secured pre-commitment from existing and new tenants for full occupancy immediately upon completion. Redevelopment began in April 2017, with phase 1 completed in September 2018, while phase 2 is expected to be completed in March 2020, it said. Frasers Property said on Friday that it completed the acquisition of interests in three logistics properties in Garching, Bavaria, and Bielefeld, in North-Rhine Westphalia, in Germany. Via wholly owned subsidiaries, it indirectly acquired 93.1 percent of the holding entities for two Bielefeld properties and 94.0 percent of the Garching property’s holding company, with the remaining stakes held by third parties, Frasers Property said in a filing to SGX on Friday. Hiap Seng Engineering warned on Friday that it expected to report net losses for the fiscal second quarter and first half ended 30 September. It said further details would be disclosed when it released its financial statements by 14 November. Addvalue Technologies said on Sunday that it signed a contract with a LEO satellite operator to use the Singapore-listed company’s InterSatellite Data Relay System (IDRS), which incorporates Inmarsat’s global L-band network. IDRS allows near-real-time links to the customer’s constellation of satellites on a global basis, it said. Addvalue said it worked with Inmarsat to develop a 985 gram terminal for use in even small satellites. Sunpower Group said on Monday that it requested a trading halt for its shares pending the release of an announcement into an investigation into its recent share price volatility. Sunpower Group said on Friday that it incorporated a wholly owned subsidiary, Dingyuan Sunpower Clean Energy, in China for the supply of heat and electricity to enterprises. It has a registered capital of 15 million yuan, it said in a filing to SGX after the market close on Friday. The new subsidiary is held by another wholly owned subsidiary, Sunpower Clean Energy Investment (Jiangsu), which is incorporated in China, it said. PACC Offshore Services Holdings, or POSH, said on Friday that its third-quarter net loss narrowed to US$5.34 million from US$5.83 million in the year-ago quarter, while revenue rose 52 percent on-year to US$79.71 million on a higher contribution from the offshore accommodation segment on improved vessel utilization. POSH’s share of joint ventures’ results swung to a loss of US$793,000 from a year-ago gain of US$16.01 million on the year-ago contribution from the POSH Terasea JV’s execution and completion of several major towage and positioning projects, it said in a filing to SGX on Friday. In its outlook, POSH said that charter and utilization rates for OSVs remained under pressure amid sector oversupply and the value of the company’s OSV fleet was expected to be further impaired by year-end. Parkson Retail Asia said on Friday that Chief Financial Officer Chia Cang Yang, age 36, has resigned to pursue other career opportunities. “The company is in the process of finding a replacement for the position of CFO and will make the necessary announcement when a suitable candidate is found,” it said in a filing to SGX after the market close on Friday. CEO Michael Remsen, assisted by Finance Manager Tan Shi Win, will oversee finance functions in the interim, it said. In early October, the department store operator said it obtained an undertaking from Parkson Holdings Bhd. to provide financial support for around a year as its auditor had issued a “going concern” note. Rex International said early on Monday that it appointed Nordic investment bank ABG Sundal Collier as its financial adviser to review non-dilutive financing options and conduct fixed income securities meetings for the oil company’s 92.65 percent-owned subsidiary, Masirah Oil, as it seeks to fund oil production work at its GA South#1 discovery off the coast of Oman. “We want to be prudent with our use of equity and explore other forms of financing options such as bonds for Masirah Oil Ltd. so as to optimise the use of our capital,” Dan Brostrom, Rex’s executive chairman, said in the statement filed to SGX on Monday. Masirah Oil holds a 100 percent interest in the Oman discovery, located in licence Block 50, and the first oil production is targeted for the second half of next year, it said. Food Empire said its wholly owned subsidiary, Future Enterprises, subscribed for 994,650 ordinary shares in its wholly owned subsidiary, Masters Corp. (MCPL), for S$994.650, or around US$726,022. That capitalized an amount due to Future Enterprises from MCPL, it said. After the deal, MCPL’s issued and paid-up share capital rose to S$1.47 million, or around US$1.06 million, comprising 1.47 ordinary shares, from S$478,679 comprising 478,679 ordinary shares, it said. Spackman Entertainment Group said on Friday that its first co-produced drama, Terius Behind Me, has maintained its No.1 ranking in drama viewership ratings for its time slot since its premiere on 27 September. The drama stars actor Jung In-sun, who is represented by Spackman Media Group, it said. This article was originally published on Monday 5 November 2018 at 8:01 A.M. SGT; it has since been updated to include items on ComfortDelGro and Sunpower.